Patty's Utopia: Tomorrow: ¡Fiesta en la Biblioteca de Seattle! / Party at the Seattle Public Library! 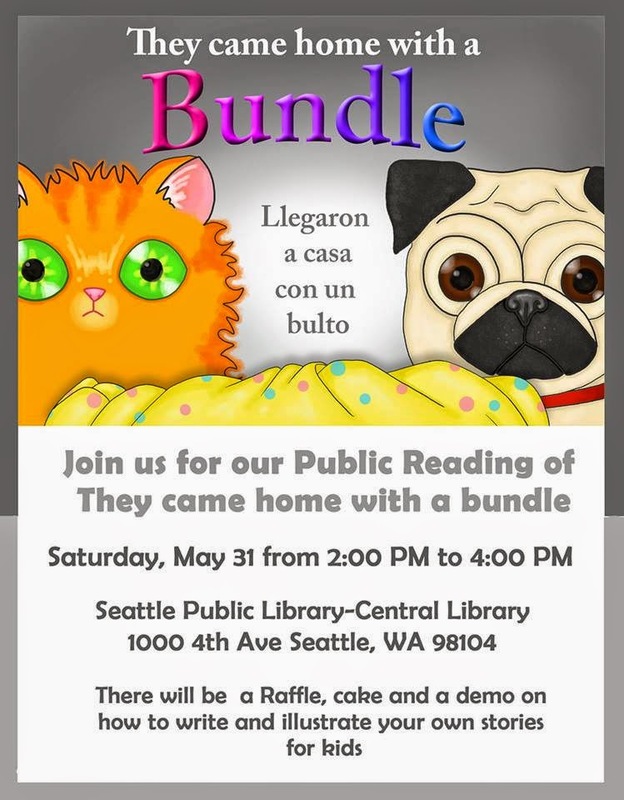 Tomorrow: ¡Fiesta en la Biblioteca de Seattle! / Party at the Seattle Public Library! I think more, and more parents are realizing how important it is to raise bilingual kids in the U.S. I love that my dear friend and Latina writer Maria de Lourdes Victoria, has been supporting the efforts of these parents for many years now, with her bilingual books for children. Tomorrow, she will be presenting her latest children's book: "They Came Home with a Bundle" at the Seattle Public Library, 4th floor, room 2, from 2:00p.m. to 4:00p.m. But wait! To make it really fun for everyone, there will be cake, piñatas, and raffles... For FREE! Come on over to Seattle because this is an opportunity that you should not miss. You may also want to ask her to sign your book!